Thrifty and Frugal Living: Christmas Gift Idea: Cover Your Hair Discount Code & Future Giveaway! Christmas Gift Idea: Cover Your Hair Discount Code & Future Giveaway! 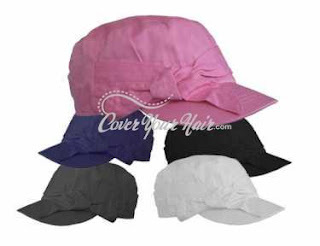 Cover Your Hair sells Hats/Caps, Headbands, Berets, Clips, Turbans, Shawls and numerous other products all at very cheap prices. I will be doing a review and another giveaway for Cover Your Hair in the future ($25 Goody bag). In the meantime, I wanted to go ahead and post a discount code in case you want to buy something for the female in your life for Christmas. While their products are great for any female, they are particularly great for teens and girls. Use promo code "blog1231" to get 20% off your order (expires 12/31/10). They already have low prices and a great clearance section, so you can score some amazing gifts for cheap. Keep an eye out for my review and giveaway! You can't sign up through someone else's referral link...you have to go through the above one...it's from MTV or something.